FROM THE EAST -Take the Eisenhower Expressway (I-290 West). Exit South at Mannheim (LaGrange Road). Take Manheim South about 4 miles to Ogden Ave. Turn right (West) to 1209 W. Ogden Avenue. (approximately 3/4 of a mile). The school is on the right (North) side of the street located next to the Sisters of St. Joseph Chapel. FROM THE WEST -Take I-88 East to I294 South. Exit East at Ogden to 1209 W. Ogden (about 2 miles). The school is on the right (North) side of the street located next to the Sisters of St. Joseph Chapel. FROM THE NORTH - TAKE I-294 South. Exit East at Ogden Avenue to 1209 W. Ogden (about 2 miles). The school is on the left (North) side of the street next to the Sisters of St. Joseph Chapel. FROM THE SOUTH -TAKE I-294 North. Exit East at Ogden Avenue to 1209 W. Ogden (about 2 miles). The school is on the left (North) side of the street next to the Sisters of St. Joseph Chapel. R.J. SANDERS FIELD: is located at the north end of the Nazareth Academy campus. Enter the campus from Ogden Avenue and drive past the main entrance of the school. Parking is just southwest of the field. MEMORIAL PARK: is located on the NE corner of LaGrange Rd. and Woodlawn Ave. in LaGrange Park. Continue past Nazareth east of Ogden about 1 mile to LaGrange Rd. Turn left onto LaGrange Rd. Take LaGrange Rd. to Woodlawn Ave. (first street past first light). Turn right onto Woodlawn. The Park is on your left, parking at the bottom of the hill. GLADSTONE PARK: Gladstone Park is located off of Roosevelt Road on Kitchner Street. From Nazareth go east on Ogden. Turn Left on La Grange Road. Turn Right at Roosevelt Road. Then make a left on Kitchner Street. Go about two blocks and the park is located on the left side. MAYFAIR PARK: Mayfair Park is located off of 31st Street on Mayfair Avenue. From Nazareth go west on Ogden. Turn right at Wolf Road. When you reach 31st Street make a right. Go about a mile and make a left on Mayfair Avenue. Continue on Mayfair for three blocks and make a left on Wakefield Street. Park is on the right. La Grange Park District is located off of East Avenue and 47th Street. From Nazareth go east on Ogden. Turn Right on East Avenue. Continue down East Avenue and the Park District is located on the right, before 47th Street. MAX: The Max is located off of 47th Street. From Nazareth go east on Ogden. Turn right onto East Avenue. When you reach 47th Street (by RR tracks), make a left. Go to Vernon Avenue and make a right. The Max is on the right. NAZARETH ACADEMY ROONEY CENTER: The Rooney Student Center is located at the north end of the Nazareth Academy Building. Use the Athletic Entrance next to Spirit Field. Sundown Meadows Forest Preserve is one of many facilities Nazareth Academy competes at. The Forest Preserve is a part of the Cook County system and is located just off of LaGrange Road (Mannheim Road) south of Joliet Road. The entrance is on the west side of LaGrange Road just off the Stevenson Expressway. Named after Joan Valenta, the stadium is located at the north end of the Nazareth Academy Campus. Enter the campus from Ogden Avenue and drive past the main entrance of the school. Parking is just west of the field. The Golf Course is located in Lockport. Take I-55 and exit south on I 355. Turn right onto Route 7, go 3/4 mile and turn left onto Farrel Rd. Travel 2 miles and turn left onto Broken Arrow Drive. Follow road to Clubhouse. MEADOWLARK GOLF COURSE:11599 Oak Brook Rd, Oak Brook, IL 60523 Clubhouse phone number is 708-562-2977. The Golf Course is located 2.45 miles from the Nazareth Academy Campus in Oak Brook. From Wolf Road go west on 31st Street (Oak Brook Road) 0.5 miles. The entrance and parking is on the left (south) of 31st Street. VALENTA STADIUM ON THE NAZARETH ACADEMY CAMPUS: named after Joan Valenta, all varsity and many lower level games are played on Valenta Stadium located at the north end of the Nazareth Academy Campus. Enter the campus from Ogden Avenue and drive past the main entrance of the school. Parking is just west of the field. OAK BROOK PARK DISTRICT (many of our JV, Sophomore and Freshman games are played here): Oak Brook Park District's address is 1450 Forest Gate in Oak Brook. The entrance to the facility is located west of Jorie Blvd just north of 31st Street..
JOHN MICHALEK SOFTBALL FIELD located on the NAZARETH ACADEMY CAMPUS: All varsity and most JV softball games are played on Michalek Field located on the Nazareth Academy Campus. MAYFAIR PARK: On occasion, Nazareth will play JV softball at Mayfair Park in Westchester. Mayfair Park is located off of 31st Street on Mayfair Avenue. From Nazareth go west on Ogden. Turn a right at Wolf Road. When you reach 31st Street make a right. Go about a mile and make a left on Mayfair Avenue. Continue on Mayfair for three blocks and make a left on Wakefield Street. Park is on the right. NAZARETH TENNIS COURTS: The newly constructed tennis facility is located on the Nazareth Academy Campus at the north end. ALL MEETS ARE AT AWAY LOCATIONS. Click on the top of the page for directions to ESCC schools or other school directions. NAZARETH ACADEMY ROONEY CENTER: The Rooney Student Center is located at the north end of the Nazareth Academy Building. Use the Athletic Entrance next to Valenta Stadium. FRANKLIN PARK ICE RINK: 9711 W. Waveland Ave. Franklin Park, IL 60131. The Rink is located 13.4 miles away from Nazareth. From Nazareth, Take La Grange Road North. Take it all the way to Addison Avenue and go East. Go to Ruby Street and go North. Then go east on Waveland Avenue to the Rink. 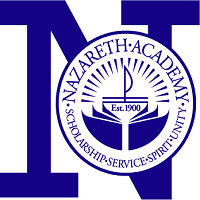 NAZARETH ACADEMY SPIRIT FIELD: All levels of Boys and Girls Lacrose are played at the VALENTA STADIUM. The Stadium is located at the north end of the Nazareth Academy Campus. Enter the campus from Ogden Avenue and drive past the main entrance of the school. Parking is just west of the field.